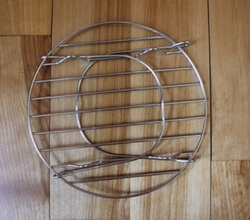 – Stainless Steel Steaming Rack, one of the best feature are the handles, that help you move the cooker or add new ingredients even when is at the hottest temperatures. 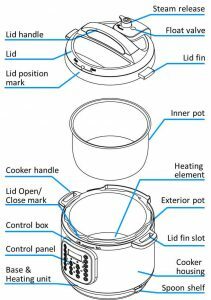 – 10 Safety Features, The pot is UL and ULC certified giving you the peace of mind that you need when cooking at high pressure. 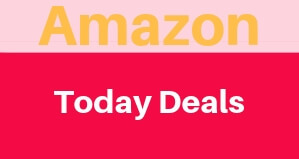 – With 14 smart programs, that make your machine more than multi-use is 7 cookers but only use the space of one, and for just $99.95. Members of this groups laugh about the old pressure cookers that cause so many troubles and accidents. But is the $100 7-in-1 model a Precious or just another internet Buzz? We tested it out to give you the best review and clear all the doubts that you can have. Here’s a video that gives you instructions on how to start to use your Instant Pot and the different functions. It’s a quick look at how to Install the condensation collector, Remove and reinstall the anti-block shield and Remove and reinstall the sealing ring. This next video is a much more comprehensive and detailed overview for all new Instant Pot owners and beginners alike. 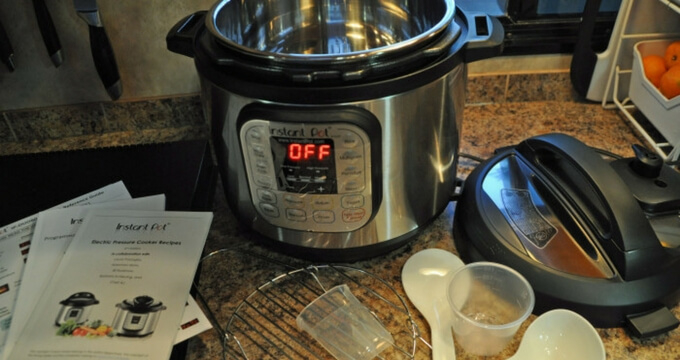 Where you will get in the way to be using your Instant Pot like a pro chef. 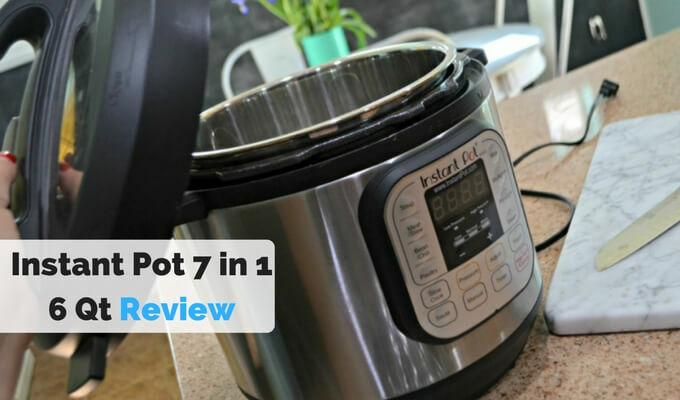 These Videos are only to know the first steps on the Instant Pot way, but keep scrolling down to get the full review on the actual 7 in 1 model. 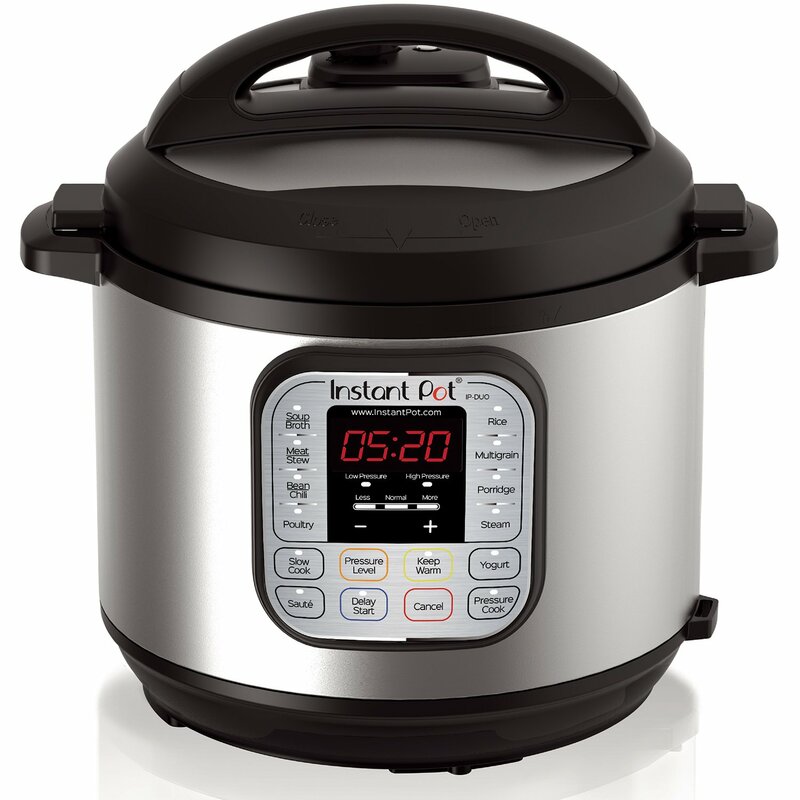 With three temperatures for sautéing alone and adjustable dual pressure settings, not to mention the capability to delay cooking for up to 24 hours, the Instant Pot IP-DUO60 really does earn its “Set It and Forget It” reputation. The IP-DUO60 is also UL and ULC certified with ten proven safety mechanisms and built to North American Electrical Standards. It’s kitchen friendly and, even when cooking, the external environment undergoes no minute temperature change, meaning that it’s safe for all of the family, Its also fingerprint resistant in case that you have a curious little hand that likes to touch the “shiny thing” that has just come out. 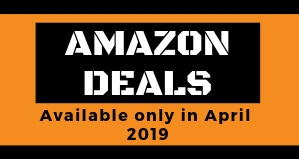 The 3-ply bottom Stainless Steel cooking pot, steaming rack (with handles) and manual/recipe book, in 4 different languages, ensures that your recipes come out just as you imagined them every time. But just what makes the Instant Pot different from other kitchen appliances? Is that third generation technology that comes with this model. Is an embedded microprocessor that is monitoring constantly and adjusts temperature and pressure levels during the whole cooking process. 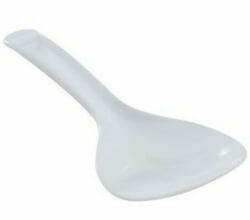 And with this model the company made HUNDREDS of lab tests, giving you one of the most tested cooking appliances on today’s market (2018). The 7 in 1 model comes with a really easy to read and understand display. The presets work programmed or if you want can be adjusted simply by pushing a button. You have 2 modes when it comes to cooking under pressure high and low. The high mode will reduce the time that you will need to make your meals, and the low one will help you to prevent overcooking delicate ingredients. You will also have 3 different saute and slow cook temperatures that cover a wide range of recipes and uses. 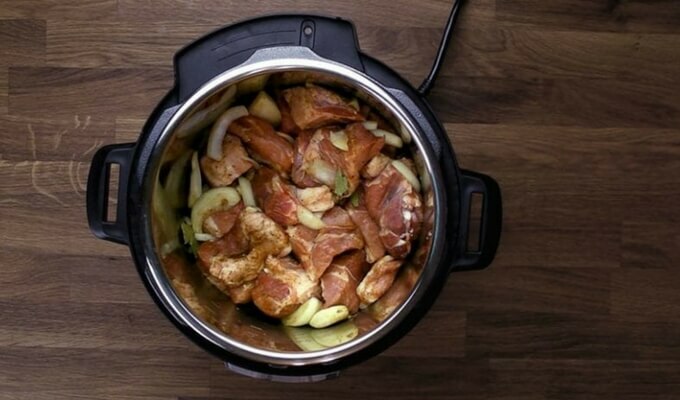 On the slow cooker settings, you can modify the cook time from 30′ up to 20 hours. Another great feature is the Delay button, that gives you up to 24 hours ahead. On the Keep warm settings, you can choose between automatic and manual. The automatic starts by itself when a cook time is finish and stays on for up to 10 hours. In case you choose the manual mode you can go much longer almost 100 hours of warm food! The cooking pot is made of Food Grade 304 (18/8) stainless steel (which is amazing!) with a 3-ply bottom for even heat distribution and retention. The lid fits snugly and locks tight for pressure cooking. The company is from Ottawa, Canada, and the Instant Pot is made in China just like most products on the market. To make your cooking experience a breeze the multifunctional Instant Pot 7-In-1 comes packed with 14 different microprocessor controlled programs. You can choose from Soup, Meat/Stew, Bean/Chili, Poultry, Sauté, Steam, Porridge, Rice, Slow Cook, Keep-Warm, Multigrain, Yogurt, Pasteurize and Fermented Rice. The Instant Pot 7-In-1 Multifunction Cooker comes in different sizes you can choose from 3, 6 and 8 quarts. It’s a round pot, so in case you like to cook certain shapes of roast or bird you maybe have a problem when it comes to fit the bird into an oval shape. We think that the 6 quarts version is the best in terms of capacity for a regular family up to 6 people. 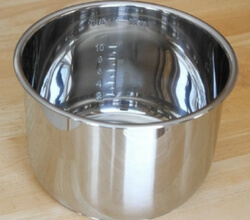 The pot is stainless steel, comes out with ease and is dishwasher safe. We love this pressure cooker for a lot of reasons but how easy is to clean it is one of our most favorite features. As we mentioned before the pot that comes along is stainless steel and is really easy to take it out. The cooking bowl is dishwasher safe and it’s really easy to clean, you can also clean it easily with a sponge and detergent. All of the accessories that come with the Instant Pot 7-1 are also dishwasher safe. The exterior is fingerprint and smudge-proof so it’s easy to keep it looking clean. When you do need to wipe it down, just use a cloth and warm, soapy water. Make sure to never submerge the pressure cooker in water and to keep the power cord dry. The outer lip and the lid require a little more careful cleaning, again using a warm, soapy dishcloth. Make sure to these parts are completely free from food residue and soap you used to clean before your next use. Pressure cookers have come a long way since the exploding messes that hurt the technique’s reputation in the 1970’s. The Instant Pot 7-In-1 Multifunction Cooker has 10 separate safety mechanisms and is both UL and ULC certified meaning it had to pass rigorous safety tests. It features pressure regulator protection, excess pressure protection, a safety lid lock, an anti-blockage vent, high-temperature warning, and several other features designed to keep this cooking method as safe as possible. Many people have reservations when buying pressure cookers because of safety concerns. 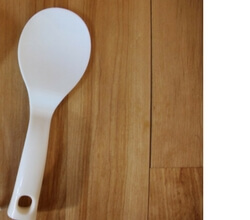 This tool uses pressure to cook food quickly, and that kind of pressure can be dangerous when not used properly. Several users commented that although the older stovetop pressure cookers and accidents associated with them had made them worry about this type of tool, they found the electronic Instant Pot to be totally safe. Since it is electronic, it can do a lot of the pressure monitoring for you and takes human error almost entirely out of the equation. 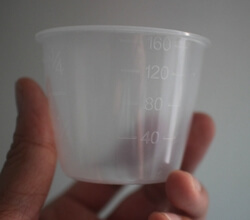 “Yogurt” function: up to 99 hours 30 minutes. 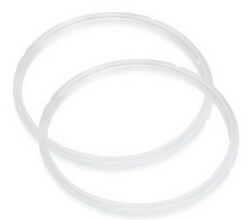 “Normal” mode for making yogurt: 36 ~ 43°C (96.8 ~ 109.4°F); “Less” mode for making Jiu Niang (fermented glutinous rice): 30 ~ 34°C (86 ~ 93.2°F); “More” for pasteurizing milk: ~83°C (~180°F). The Instant Pot 7-In-1 Multifunction Cooker comes with a 1-year limited warranty that covers defects in workmanship and material. No real surprises there. Pretty standard. They do want to see a copy of your original receipt so scan and save or store it somewhere you’ll be able to find it if needed. Assuming the problem is covered under the warranty, the manufacturer will replace, repair, or help you repair the unit. 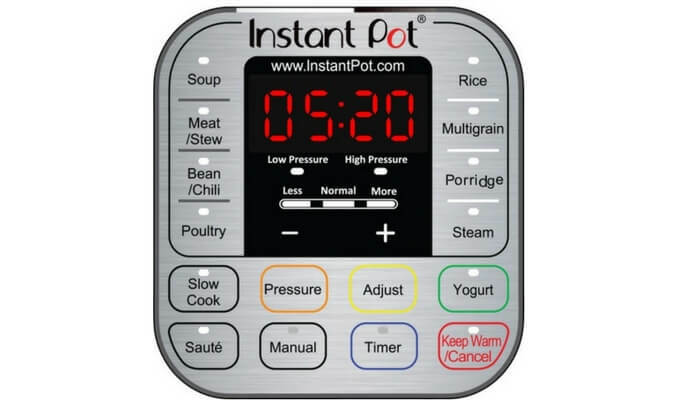 The manual that comes with the Instant Pot is really easy to understand, so for those that are new to the Instant pot experience you are going to be cover with all the features and ways of use. The manual also comes with a cooking time chart and recipe ideas. 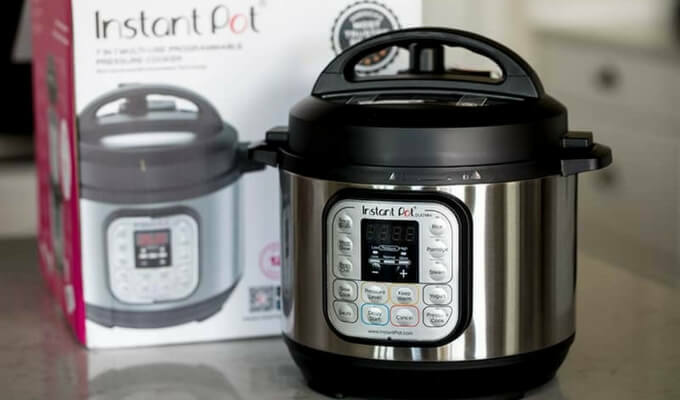 The Instant Pot 7-In-1 Multifunction Cooker is one of the best models from the Instant Por family and without a doubt one of the best Electric pressure cookers on today’s market. having in mind that cost less than $100 is a must in any kitchen. Of course, if you already have high quality specialized pots for each of the functions The IP 7-In-1 is not going to be the best when compared to specialized machines for each task. Although you will have 7 appliances instead of one. So when space is an issue on your kitchen that’s when the Instant pot wins over and over, and let’s be honest if you got 7 different appliances you clearly spend way more than $100. On top of that, it’s pretty easy to use. 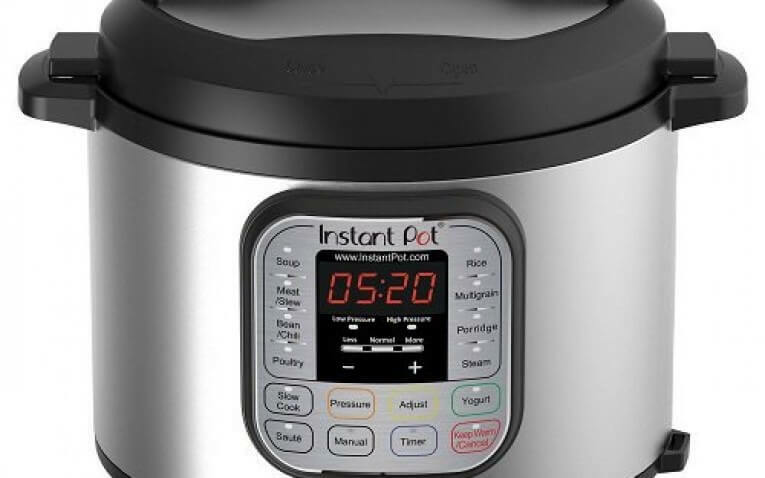 If you already have high-quality specialized pots for each of the functions The Instant Pot 7-In-1 Multifunction Cooker does, I’m sure you’d find they outperformed it in their specialized way – but you’d have 7 different units cluttering your kitchen. If space is an issue, this is a solid solution. On top of that, it’s pretty easy to use. As a plus, along with the manual and quick reference guide, there’s a pressure cooking booklet that includes cooking timetables as well!